We spent three nights in Munich during our Spring road trip 2017. We didn't have the best weather while in Munich so we spent one of the days traveling to Nuremberg as the weather forecast said it would be nicer. On the first day we powered through some freezing rain to visit Marienplatz Square. We watched as the Glockenspiel chimed and we admired the architecture of the large building it is hosted in. 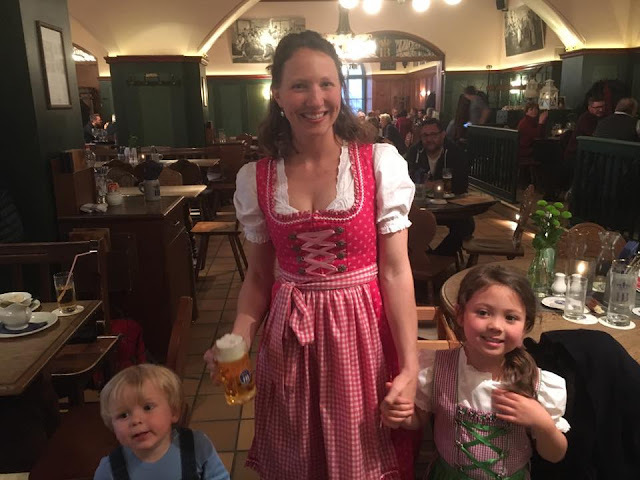 We quickly made our way to the main Hofbrauhaus just a few minutes walk from Marienplatz to get out of the cold rain and warm ourselves with liters of beer, big pretzels, Saurkraut and Spaetzle. The next day we searched for nicer weather in nearby cities and decided on Nuremberg. We drove the 1 and a half hours to the neighboring town and followed Rick Steves tour. We also found a nice Mexican restaurant which we were very excited to dine at (not much Mexican food in Switzerland). When returning to Munich later that afternoon we walked through downtown, saw the cathedral St. Peter's and then to the big outdoor market, Viktualienmarkt. On our way out of town the following morning we stopped at Munich's English Garden, however the weather was so cold that we didn't stay long. If we get a chance to go back to Munich I hope that our weather is better and I would look forward to walking through this park and finding a biergarten while letting the children play on one of the numerous playgrounds. For more photos of our time in Munich (and Nuremberg and Dachau) click here.